I woke up earlier than usual on our second full day in Sicily, just after half six, so I got out of bed and showered, and at around seven we wandered down to the market stall only to find that it wasn't set up yet, so we went back to the apartment and threw together a breakfast using what we had left from the day before: bananas, croissants and coffee. We'd decided to catch the Interbus to Syracuse at 8:30, so we left the apartment at about ten past eight and walked to the bus station. Unlike in the UK, tickets are bought at the station rather than on the bus, so we went over to the Interbus hut and bought to return tickets to Syracuse, which cost €9.50 each, which isn't bad for an hour and a half journey. The bus was more like a coach than a bus, so it was nice and spacious with comfy seats and air-conditioning. We got to Syracuse at around ten, and the bus dropped us in what seemed like the center of the city, and nowhere near a beach. We walked towards a slightly more built-up area and came to a river where we found a guide offering boat tours. We asked him where the beach was, and he told us it was too far to walk, so we decided to find a little café where we could get a drink and figure out what we could do. We did find one, and as we walked through the gate leading into it, we found that we'd walked into a private beach with toilets, showers, a restaurant and a bar. Not only that, but it was only €12 for two sunbeds and an umbrella for the day! There were probably less than twelve umbrellas on the beach, and throughout the day they were never all in use, so the beach was wonderfully quiet. The bar also played smooth jazz versions of well-known songs, creating a really relaxed and luxurious atmosphere. 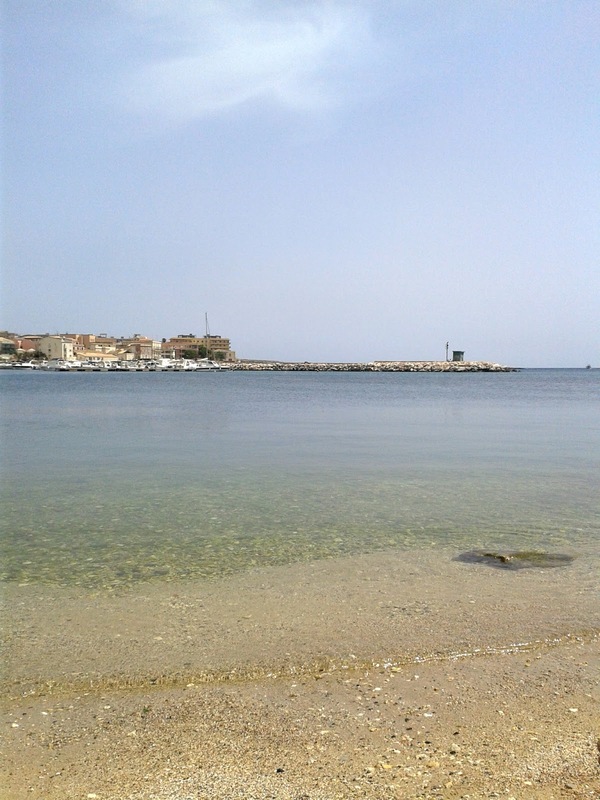 We decided that we might as well have lunch at the beach rather than walking around trying to find somewhere, which turned out to be a very good call – the food was so good and so well priced, and we could sit with a beautiful view of the beach. 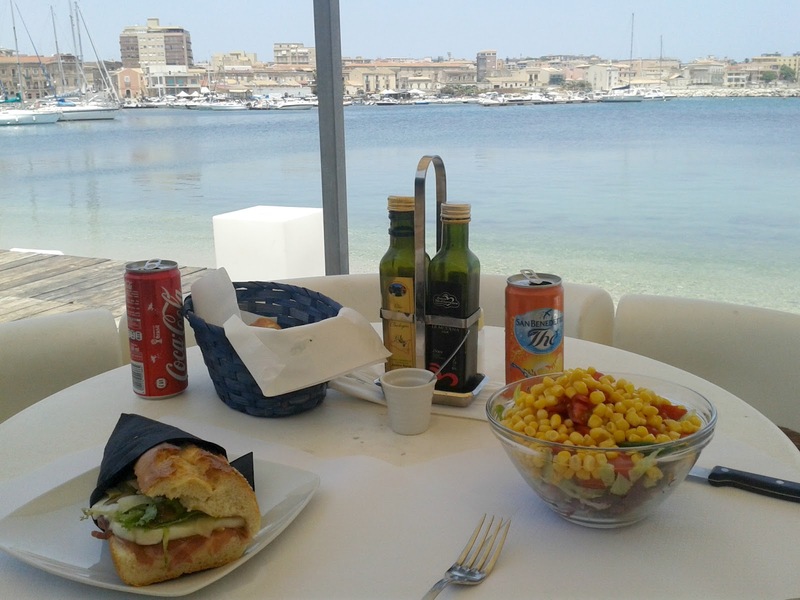 For lunch, the boy had a mozzarella, lettuce, ham and olive panini, and I had a salad with lettuce, red lettuce, sweetcorn and baby tomatoes, and a can of peach iced tea – my go-to drink on holiday. We were given some bread while we waited with some balsamic vinegar and local olive oil to dip it in. I didn't try the oil, but the boy said it was incredible. After some sun-bathing and swimming, we decided to cool off with some gelato. This time I actually did get coffee flavour, and it was amazing – it was so fudgy and rich it was almost chewy, and the coffee flavour was perfectly strong but still milky. I only wish you guys could have tasted it! We left the beach at half four to catch the bus home at five, which got us back to Catania at half six. We picked up some peaches on the way back to the apartment, and when we got back we just relaxed for a while before showering and getting ready to go out at about half nine (the Italians eat dinner really late, so we thought we'd give it a go). There was a steak house at the end of our street (Via Porta di Ferro) which looked really lovely, so we decided to treat ourselves and go there for dinner. The boy had steak and salad, and I had a Greek salad topped with the most amazing herb-y potatoes, the saltiest, crumbliest feta and some huge olives. We also had some local wine which was a lovely rich red, and once we'd finished we wandered around the nearby square for a bit before going back to the apartment at around eleven, incredibly relaxed and a little bit tanned.